Cycling is part of the solution and in this lecture how Mia will discuss how Portland does it. She is promoting her new book ($19.95) and yes, I did buy a copy. Additional funding provided by bikes on the drive at 1350 Commercial Drive who also offered a nice bag as the prize for a draw at the end of the evening. Shame more of those cyclists could not wait for that. I must also not forget to mention Translink who also will be providing a podcast of the talk in due course. “I was a Canadian.” Early in life Ma moved to the US. “Nobody walked anywhere in Texas – my brother Bruce told me to “take my bike” when I went to grad school in Washington DC”. As a result of cycling she lost weight and became much healthier – and found the passion which has driven her career. From there she went to a number of third world cities where she saw dreadful traffic congestion and wondered, “How is it possible that in places where no-one can afford a car, all the solutions promoted by the US (and others) were more roads.” She became the Bicycle Co-ordinator for City of Portland. In 1971 Oregon passed a Bike Bill which specified that a minimum of 1% of the transportation budget had to be sent on bicycle facilities. Earl Blumenauer was elected to city council and since became known as “the godfather of livability”. The team she lead aimed to reach around 10% of the population. If they could convince three of the thirty people who might come to an open house, they felt that they had a chance. In 1986 the City adopted network of bikeways. Portland now has lots of greenways (off road paths) 300 miles of bikeways. In 1996 they started to innovate with bike signals, signage that specifies distance as both miles and times — at 10mph. This promotes the thought “Wow! I am really speedy. Bike boxes were extremely controversial as were coloured bike lanes in conflict areas. these conveyed the rule that bikes have the right of way on blue markings. None of these are yet approved at the national level. In 20 years while she get concessions from former opponents, she still gets push back. It would be nice if the measures now being introduced on Broadway in Portland, New York and Seattle could be matched in Vancouver. 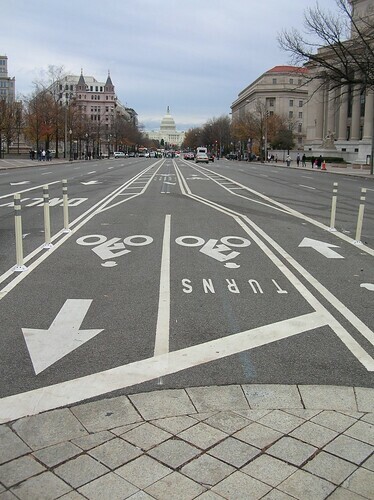 In Washington DC they have introduced centre lanes (my photo). She is now working around the world. The lessons do translate. She is also teaching at the University of Portland, which includes mid career training for engineers and has “touched more than 1,000 communities”. There is increasing bike use. We have increased capacity/use on bridges and the crash rate has plummeted for less than 1% of the City transportation budget “It’s the best bang for the buck”. Around one third of greenhouse gas emissions come from transportation. There are healthcare cost savings too. Currently the $4.5m spent annually on cycling in the US saves $65bn a year. We are making progress in urban centres – once they get a taste they want more. q – This room is 95% Caucasian. That’s not like the rest of the city. Have you encountered this in other cities? q – is this really making a difference? In the City is one thing but in the region it’s still “Portland in the 50s” The freeway expansions are being greenwashed by adding bike lanes. We need a real revolt and e should not be satisfied with just 1%of the budget. What is the role for professionals? q – linked to disabled access, walking, transit? q – We need to get in Tsawwassen what Vancouver has. Is this getting out to the suburbs? Contributed from the audience: In Portland they have increased helmet use to 80% of rider but they don’t have a helmet law. Helmet laws deter cycling – her chart shows a dip in cycling 1993 when a child helmet law was introduced. In Canada in 1996 in 7 cities compared to 2006 showed that cities without helmet laws grew cycling by almost 40%, compared to those with helmet laws 3%. In Metro Van we have actually gone down in that period. q What’s the next step here? I did not go to this lecture, partly because there was no advanced on line booking system as there is now for SFU, so I was not sure I would get a seat, but also because he had spoken some time ago in Richmond and I had blogged about it then. I wasn’t sure there was going to be much to add. The Globe and Mail reports today that there has been a shift in location decisions of companies. They are now willing to pay more for a downtown location, both reduce their carbon footprint and to “attract well-educated, sophisticated workers.” There’s quite a lot of anecdote here, but also some data on vacancy rates. The examples are from Toronto and Edmonton but there has also been increasing interest in new office developments in downtown Vancouver. It is encouraging that LEED certification is mentioned – though much of the discussion would seem to point to employee travel behaviour. LEED ND isn’t mentioned. One of the great issues with regional planning here was the suburban office park – which was not anticipated in the LRSP. These are not going to go away any time soon, but they will have to start adapting. I would expect that developers will try to retrofit these places to become more like traditional urban “central places” with a variety of uses. If we had wise leaders, they would be increasing travel options at such locations, and looking at fiscal measures to encourage the “highest and best use” of land currently devoted to “free” parking. That would require some effective support for transit – and a lot of investment in better walking and cycling access to such locations. I would be interested to see a movement like this develop here. It could be a bit like the way that redundant suburban shopping malls in the US are now being redeveloped for mixed uses. I have been reluctant to simply pass along press releases. They have to pass my own stringent tests which include relevance to Greater Vancouver and also my sense of how much the main stream media might not cover the release. I also try always to only put things on this blog that I have an opinion about. I try to write something – not just pass things along. Two press releases came my way overnight that both seem to pass this test. One talks about growth – and how it can be smarter. The other talks more about how other places do things differently to us and have had better outcomes. So I think both are worthwhile – and both point to new studies which provide evidence to support sensible policy making. the surprisingly high eco-footprint of tall condo buildings, which rank a distant last in energy efficiency to all other dwelling options (some 10 times less efficient than many houses, town homes, and small apartment buildings). As yesterday’s blog post pointed out just looking at the building, without considering its location can be very misleading. You can have a very highly efficient building but if it is in the wrong place, where everybody has to drive to get to it, then it won’t be very energy efficient. You could put up with a less than optimal building – in terms of its heating/cooling requirement – if it was more efficient in terms of servicing and the travel patterns and choices of its users. You must always consider transportation and land use together. They are the same issue – not two separate ones. I cannot say I like concrete canyons very much either, and I do think we need to get better at growing our own food. But not everyone wants to be a gardener, and there are all sorts of ways – green roofs, green walls – that we can better utilize space that have multiple benefits. I recognize that Damien Gills and Rafe Mair are both very effective campaigners, but they both seem to embrace a style that puts passion before reflection, and likes to see everything in black and white. Most policy debates require a more nuanced approach, and politics is still what it has always been – the art of the possible. There are also two things that everybody hates. One is sprawl, the other is density. We can accommodate a lot more people in the City of Vancouver at densities which are currently permitted. But we would have to start building a different kind of transit system to accommodate that kind of growth. And neighbourhoods need to have a reason to embrace change, which means they need to be involved in determining what is going to done to the place they live in. We can accommodate more people in downtown, but we need the present transit system to have expansion capabilities: we forgot that with the Canada Line, and we are only just now starting to expand the Expo Line, which had long been suffering from lack of trains. We can get people to use transit, as UPass showed, but we did not have anything like enough buses for them, and when universities are located at the end of a peninsula, or on top of a mountain, more buses may not even be the most effective solution. Those failings show a lack of “joined up thinking”. We have two levels of government who cannot agree on what should be done and who should do it. It is not that considering taller buildings is wrong. It is that we do not have the ability to adapt our urban form to growth – of any kind. And then we are surprised – over and over again – when this same approach produces results we did not anticipate. 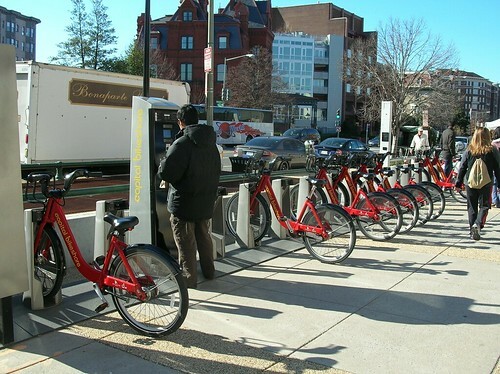 Washington, D.C. –January 19, 2011—Efficient urban planning – known as smart growth development – enhances community prosperity and generates economic benefits for local businesses, households and governments, according to a new report published today by the Center for Clean Air Policy (CCAP). The study, Growing Wealthier: Smart Growth, Climate Change and Prosperity, reveals how reduced driving and efficient land use planning are strongly interconnected with economic growth and better quality of life. Growing Wealthier reports that pent-up demand for walkable communities is reshaping the real estate market. Cities investing in public transportation and downtown development are experiencing cost savings, growing tax revenues, increased property values and booming retail sales. The authors of the report, CCAP Transportation Analyst Chuck Kooshian and CCAP Director of Transportation Programs Steve Winkelman, encourage policy makers and practitioners to promote economic well-being by mixing land uses and providing a diversity of transportation and housing choices to enhance accessibility and promote travel efficiency. Growing Wealthier demonstrates that the rate of increase in driving and income in the U.S. has been unequal. From 1967 to 2008, household driving increased by 60 percent while average household income increased by 52 percent, but median household income increased by only 25 percent. Thus, the experience for most Americans over the last 40 years was one of driving substantially more but not sharing proportionately in income growth. The report also examines how reducing “empty miles,” driving that contributes little or nothing to the economy, will help meet climate protection goals while also yielding positive economic impacts. Dallas, Texas – downtown retail sales grew 33 percent a year after the light rail system began operation. Sarasota, Fla. – downtown development costs were half that of suburban development while generating four times the tax revenue. Portland, Ore. – a $100 million investment in streetcars helped attract $3.5 billion in private investments. Denver, Colo. – home values within a half-mile of stations on the Southeast light rail line rose by 18 percent, while home values in the rest of Denver declined by 8 percent from 2006-2008. Growing Wealthier documents how efficient land use planning can improve household resilience to rising oil prices by enhancing travel choices.Allowing more people to live closer to job centers can boost employment rates and income levels for low-wage workers while reducing exposure to congestion for all. Smart growth policies are also shown to cut government infrastructure costs, enhance public health and conserve natural resources. The report provides recommendations for the federal government to “equip and empower” state and local experts to implement smart growth policies and realize their economic and livability benefits. The federal government should increase funding for research on the economic impacts of transportation and land use policies and provide technical assistance to help communities implement and evaluate smart growth and travel efficiency policies. “Do. Measure. Learn.” policy programs centered on action, measurement and analysis will give practitioners room to experiment and build upon their successes. Incentive-based programs that reward economic and environmental sustainability will encourage more communities to follow suit. The executive summary and full report are available at www.ccap.org and at www.growingwealthier.info. For more information on CCAP’s transportation program, please visit http://www.ccap.org/transportation.html. January 19, 2011, NYC: European cities are reaping the rewards of innovative parking policies, including revitalized town centers; big reductions in car use; drops in air pollution and rising quality of urban life, according to Europe’s Parking U-Turn: From Accommodation to Regulation, published today (January 19th) by the Institute for Transportation and Development Policy. Visit http://www.itdp.org/documents/European_Parking_U-Turn.pdf for a copy of the report. • Parking is increasingly linked to public transport. Amsterdam, Paris, Zurich and Strasbourg limit how much parking is allowed in new developments based on how far it is to walk to a bus, tram or metro stop. Zurich has made significant investments in new tram and bus lines while making parking more expensive and less convenient. As a result, between 2000 and 2005, the share of public transit use went up by 7%, while the share of cars in traffic declined by 6%. • European cities are ahead of the rest of the world in charging rational prices for on-street parking. In Paris, the on-street parking supply has been reduced by more than 9% since 2003, and of the remaining stock, 95% is paid parking. The result, along with other transport infrastructure improvements, has been a 13% decrease in driving. • Parking reforms are becoming more popular than congestion charging. While London, Stockholm, and a few other European cities have managed to implement congestion charging, more are turning to parking. Parking caps have been set in Zurich and Hamburg’s business districts to freeze the existing supply, where access to public transport is easiest. • Revenue gathered from parking tariffs is being invested to support other mobility needs. In Barcelona, 100% of revenue goes to operate Bicing—the city’s public bike system. Several boroughs in London use parking revenue to subsidize transit passes for seniors and the disabled, who ride public transit for free. The ten cities featured are Amsterdam, Antwerp, Barcelona, Copenhagen, London, Munich, Paris, Stockholm, Strasbourg and Zurich. The message of the movie is that man made global warming can be stopped, mostly by a combination of technologies – many of which are available – and individual action. There is remarkably little in it about transport – except for the expected singling out of air travel as the worst offender. Given that this movie visits nine countries around the world, this does of course leave the makers open to the same criticism that has been aimed at Al Gore’s carbon footprint. I did learn a lot about China that was news to me. Since China and India are always used as examples of countries that will not give up anything in terms of development in order to help the world cut its emissions, the movie changed my perception completely. China is serious about tackling its ghg emissions in a way that the US and Canada are not. There was quite a lot of gosh gee whiz about the technologies, and not very much in the way of critical assessment of how much energy get emitted in creating all this new kit. Embodied energy is obviously important but the nearest I heard to an acknowledgement of that was the remark that an electric car’s dirtiest day was the day you drive it off the lot. In other words, there is a conviction that electricity generation can only get cleaner. I was a bit puzzled about the Chinese coal fired power station that was supposed to be cleaner, and I saw nothing of the recent concerns that some types of carbon sequestration – such as ground injection into oil fields – are not as permanent as advertised. This is not a new movie. It was premiered six months ago. It took two years to make, and, of course, the world moves on. I was also a bit skeptical of some of the experts. For example, Amory Lovins has a lot to say. He has been around for a long while – he started to get attention during the 1970s oil crisis – which was when I started to work on this stuff myself. That means he has had plenty of time to be shown wrong, and sadly he made many predictions of what could be done as though it would be. For example, he thought that the motor industry would abandon pressed steel bodies in favour of carbon fibre. While there is a lot more plastic in cars these days, they are still mostly very heavy lumps of metal. Missing was any discussion of urban form or land use. I think that is probably because it is very much a long term issue – and will not produce much in the way of change in the vanishing amount of time was have left to turn things around. But it will also be a while before there is a smart grid – especially one connecting the Sahara desert solar power stations to Europe. Or a high speed train network here – Europe is well on the way and, of course, Japan has already got one. Obama is only just getting started – and we are not even thinking about it yet. If you read this blog and agree with any of its stated objectives, I doubt you need to see this movie. I also think the sort of people who might see screening at community events and so on will already be converted. Followers of Stephen Harper or Sarah Palin won’t give it any time at all. But maybe some of the fundies could do with a jolt of – well its all very well you being right but we have to do something and do it now so it might as well be this – reality. Thanks to Ned Jacobs for sending this around. Its quite a short piece from The Age in Victoria, Australia. Shame you have to be an Australian Planner to actually get to read it. Quite appropriate here given the recent government sponsored twaddle about rail for the valley and “not enough density” to support transit. They do it by comparing places that have good public transit to Australian cities. There is of course one great outlier – Los Angeles, even though it is the most densely populated city in the United States, has low transit use. So what is needed then? Which I think Translink would say that we already have in large measure. But there are still really low levels of market penetration in places like Langley. Not as dreadful as Chilliwack of course. And we really do not have rail in our outer suburbs like they do in Australian cities – electric trains that run in both directions, all day and every day. My conclusion is that it really requires more than just density – as Los Angeles shows – and more than lip service to issues like frequency. Fifteen minute headways are really not “frequent” – especially when service is unreliable, due to traffic congestion or the multiple problems that beset under funded transit systems. Yes we can make transfers at no extra charge but convenience – and reliability again – is a big issue. There are still quite bizarre scheduling decisions – like short turning half the #3 service at the end of Main Street instead of running all the way to the Canada Line Marine Drive Station one kilometre away. Far side of the intersection bus stops impose delays and the need to cross busy intersections on foot meaning even scheduled meets will often be missed – and so and so forth. The devil is always in the detail, and we don’t do that well. Like ignoring the benefits of clock face service – something taken for granted in Zurich – same size, same density, lots more transit use. It comes down to money in the end. No mention of that here. And, of course, what it is spent on. It also seems to ignore the fact that a lot of Vancouver is built at suburban densities yet has much more transit service than places further out but as dense or even denser.